If you’re fairly new to SAGE (or even if you are a SAGE power user), chances are you’ve got some questions for us! Here are just a few frequently asked questions we receive with some helpful links and tutorials for you to refer back to! Yes, of course! We offer three platforms of our product research and business management solutions to suit the needs of all of our users. SAGE Web is our web-based platform for Mac users. You can use SAGE Web on any device with internet access (just type in sageweb.com). SAGE Online is our flagship product for PC users. P.S. You can check out some of its history (and some great throwback photos) in our 25th anniversary post! SAGE Mobile is our app for iOS and Android devices so you can work while you’re traveling, at a tradeshow, or anytime you’re away from your office computer. All the work you do in other SAGE platforms is saved in the cloud, so you can access all your information in SAGE Mobile. Occasionally, SAGE Member is mistaken for another software platform, but you can think of sagemember.com as your control panel for all things SAGE. You can take care of all your administrative details here, e.g. manage users, update your contact information, put in a support ticket. SAGE Member also serves as a portal where you can manage your SAGE Website, order SAGE Inspire Catalogs, and watch tutorial videos. If you have to reformat your hard drive, purchase a new PC, or start working from a different location, you can easily download SAGE Online and log in with your SAGE ID and password to access all of your information. Just visit our Downloads page for a quick rundown (or a short how-to video if that’s more your style). It’s crazy how many passwords you have to remember these days. We totally get that. No matter what platform you are in (or even if you are on sagemember.com), there is a handy, “Forgot Password” link by each login area! After “Forgot Password,” you’ll type in your login ID and email address and click the Reset Password button. Each person who has been set up as a user in sagemember.com has a login ID. 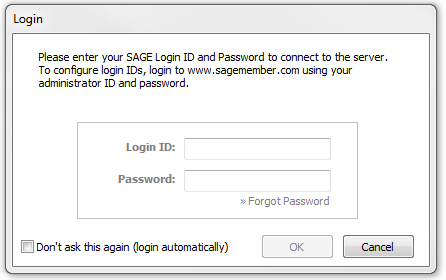 You can also use your SAGE account number as the login ID to reset your main administration password. If you’re having an especially hard day and forgot your login ID, no worries, just give us a call (800.925.7243). Sometimes a client wants a product so hard to find that you start to wonder if it even exists! Chances are, with over a million products in the SAGE database, that elusive product is there, you just need a little help from your friends. With the SAGE Discussion Groups, you can post a product question for our community of distributors. You can also attach a photo to your post if you’re looking for something specific. You can also contact your account executive, or utilize our free and unlimited research assistance! Drop an email to research@sageworld.com or snap a photo in SAGE Mobile and one of our research experts will help you locate it in our database! Once the product has been found, we will send you an email to let you know. Click Account on the left side. Click the Edit button under Actions on the right-hand side for the user you want to update. Navigate down to the Picture section where you can add or erase a photo. Choose a file to upload a picture. Click the green Save Changes button at the bottom of the page. Yes! You can easily find embroiderers, screen printers, engravers, and more with the new decorator search module in SAGE Online 12.5! Choose from over 20 decorating services, and search by location to find nearby providers! You can watch our tutorial video to get up to speed on the decorator’s search. The Power of Two is a program that offers incredible value. It’s the result of a special collaboration between the Promotional Products Association International and SAGE, the two leading organizations in the promotional products industry. The Power of Two is the easiest and most cost-effective way to get the highest quality products, services, and resources to support your business, bar none. That means that if you have a membership with PPAI, you automatically have a SAGE Total Access subscription, and vice versa, and at a lower cost than other industry subscriptions. Check out some of the benefits! We know designing marketing emails is not at the top of your to-do list. That’s why our graphic designers put in the work on these email campaigns so you don’t have to. We add two new themed campaigns each month to SAGE Online that are already stocked with products. When your clients click on a product, they’ll be taken to your website! Open SAGE Online and click on the Email Campaigns tab. Select your distribution list. If you have client data saved in your CRM, you check off clients and/or prospects. Or, you can manually enter your contacts. And send! You can send it now or you can even schedule it to automatically send later. Check out some of our themes! The presentation of a product can make or break a sale. The Presentation Publisher (available in all three SAGE platforms) allows you to quickly and easily create presentations that are professional and fit with your company’s brand. You can add virtual samples of products to give your client an idea of what their final product will look like! To improve the sales process, you and your clients can add comments and feedback directly to a presentation. You can also receive notifications when a client opens a presentation or leaves feedback. To see how to pull together your next presentation, check out our step-by-step video! Hopefully, you gathered up a few new tidbits of information to help you go about your workday! And just remember, you can contact us with any questions, anytime! You can get in touch with your account executive, put in a support ticket in sagemember.com, or give us a call at 800.925.7243 and we’ll take it from there!